Innes (Randolph) Harris and Percy Harris, Sr.
Name: Innes (Randolph) Harris and Percy Harris, Sr. 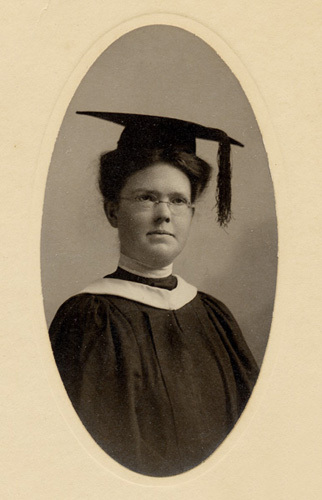 Comments: Innes Randolph is shown in graduation cap and gown for her 1904 graduation from Randolph-Macon Woman's College in Lynchburg, Virginia. 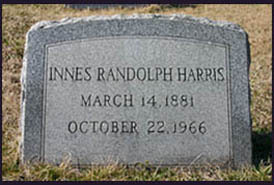 She met Percy Harris in Amherst, Virginia, when both the Randolph and Harris families moved there in the early 1890's. After Innes graduated from college, she and Percy married on September 20, 1904, in Pelham, North Carolina. At that time, Percy Harris was a young medical student at Medical College of Virginia (MCV) in Richmond. 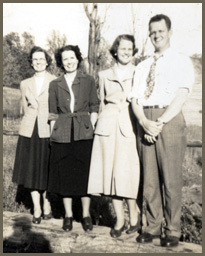 When Percy graduated from MCV in 1905, the Harrises lived briefly in Grafton, Virginia, but were not fond of the plentiful snakes and mosquitoes of the Chesapeake Bay area. They moved to Howardsville where their first child, Innes, was born in October 1905. 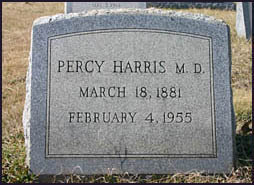 In 1906, the Harris family moved to Norwood, where Percy began a general practice and also supplemented his income by serving as a doctor for the Piedmont Quarry and for the Chesapeake and Ohio Railroad. As a railroad doctor Percy treated sick and injured employees, a role he continued until 1950. On more than one occasion, Percy was taken to an injured worker via a railroad handcar. Two more Harris children, Mary Peyton (1908) and Percy, Jr. (1911), were born in Norwood. The Harris family moved to Scottsville in 1912, a town that would be their home for over forty years and the birthplace of their fourth child, Susan Randolph, in 1913. Upon arrival in Scottsville, Percy set up his general practitioner office over the Fidelity Bank at the corner of Main and Valley Streets. The Harris family lived first in the Sclater Hotel on Main Street and then moved over Miss Etta Harris' store at the north corner of Lindsay and Valley Street. Some time later, they moved to another second-floor apartment over Dickinson's Drugstore (now Bruce's Drug) at the north corner of West Main and Valley Street. In 1915, the Harrises bought the old Creamery on West Main Street and converted it to a home and doctor's office. The Creamery was located on the west corner of Lot 165 and across from the old Scottsville High School. 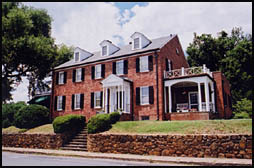 In 1934, the Harris family moved across West Main Street to a new home, built out of bricks from the Old Dispensary (also known as the Brady School). Today this elegant home is called the Harris House and overlooks the Scottsville Post Office. Percy conducted a thriving general medical practice in Scottsville. As John Randolph Phillips said in his book, Of Town and The River, A Folk History of Scottsville, Virginia, "Doctor Percy Harris was a happy giant who also served as Mayor and whose very presence in a sick room started the ball of recovery to rolling." He made house calls until 1950, and continued his office practice until the day he died. Percy had just seen a patient and then came into his living room and collapsed. He lacked four months to have practiced medicine for 50 years. 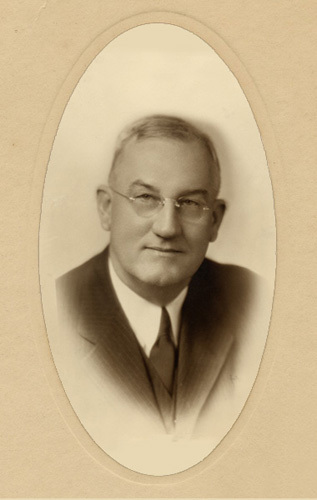 Percy served as Scottsville's Mayor from 1943-1953 and was instrumental in attracting U.S. Rubber to build a factory for rayon tire cord production in Scottsville. This factory benefited Scottsville's	economy by increasing local job opportunities, attracting more residents to the town, and increasing sales at local stores. 1) Innes Roberta Harris, born October 4, 1905, Howardsville, VA; died April 27, 2003, Charlottesville, VA. Innes married John Adkins Moulton on June 28, 1923. They were the parents of two children: John Adkins Moulton, Jr. (1924-1929) and Randolph Harris Moulton (1930- ). 2) Mary Peyton Harris, born 1908, Norwood, VA; died February 3, 2001, Charlottesville, VA. Mary married first, Capers Boan; she married secondly, John E. Elgin on July 12, 1958. 3) Percy Harris, Jr., born 1911, Norwood, VA. Percy, Jr., married first Marie Brand on April 13, 1935, and was married four times. Percy, Jr., married fourth, Eila O. Knight on October 29, 1973. 4) Susan Randolph Harris, born February 13, 1914, Scottsville, VA; died July 8, 1988, buried at Scottsville Cemetery, Scottsville, VA. Susan married first Charles Poss; she was married five times. Susan married her last husband, Frank Edverse Hamilton, Jr., on July 19, 1963. Percy Harris, Sr., died February 4, 1955, in Scottsville; his wife, Innes (Randolph) Harris died October 22, 1966, in Charlottesville, Virginia. Both Harrises are buried at Scottsville Cemetery, and their gravestones are shown below. These photos are part of the Ranny Moulton collection. Ranny resides in Macon, Georgia, and is the grandson of Innes (Randolph) Harris and Percy Harris, Sr., and the son of John Adkins and Innes (Harris) Moulton.